What’s Bueno at the 99¢ Only Store: Smashbar! WHEN I SAY “Smashbar” you think of that trendy bar in Silverlake, crowded wall to wall with hipster douchebags all reeking of clove cigarettes and sweat, right? No, no – wait. “Smashbar” – they’re that late 90s band that had that song “All Star” that’s been a staple of movie trailers since “Walking on Sunshine” overslept and missed the audition. Or, no, “Smashbar:” that overpriced line of cosmetics that you bought a Groupon for, figuring your girlfriend would be thrilled…but she didn’t redeem it and now you’re out forty bucks. Or maybe “Smashbar” is that studio near La Brea in Hollywood where you worked as a caterer for the wrap party for that Lifetime TV movie last summer and met Richard Karn from Home Improvement and Richard Thomas from The Waltons. No! No, wait – “Smashbar” is that so-called all-in-one website development software you paid $59 for and downloaded from Smith-Micro but never used and completely forgot about until now. Nope? Oh, of course – “Smashbar” – it’s the thick steel pipe that runs across the top of your Jeep Wrangler so even if you fly off a cliff careening down PCH drunk as Mel Gibson, you’ll still be able to walk away from the crash and hide among the rocks until you sober up. You couldn’t be more wrong, but that certainly hasn’t kept you from trying! …and by Godfrey, it’s today’s What’s Bueno at the 99¢ Only Store Item of the Week today. For 99¢ Only, you get a box of eight of these snack bars. Each is just 90 calories, has no high fructose corn syrup and is a good source of fiber and calcium – but don’t let that scare you off, pal: like me, you’ll be eating four or five of these in one sitting. They’re just that good! “Specifics?” you demand with arched eyebrows, indicating dubiousness yet betraying mild interest. I’ll specifics you! Pretzels! Berries! Oat cereal! Chocolate! That specific enough for you? Then I get home and try one, they turn out to be the best purchase I’ve made at the 99¢ Only Store since they had all that high-end but about-to-expire personal lubricant two years ago. And like an idiot, I only bought two goddamn boxes! I should have bought like ten! Ah, the classic 99¢ Only Store shopper’s remorse. You and I, we know it all too well. Actually, I guess the true “classic 99¢ Only Store shopper’s remorse” comes about six hours after eating anything with dairy in it from their refrigerated case. I’m kidding! 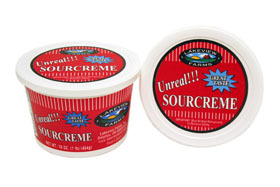 I’m sure this stuff is wonderful. 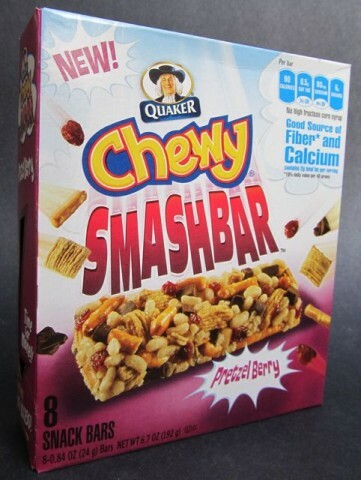 Back to Smashbar: Like me, you’re wondering how such a fantastic new product from the good people at Quaker Oats ended up in the grocery landfill that is the 99¢ Only store. Here’s my theory: Whoever designed the package thought it might be fun to have a side panel featuring a cut-out arrow so you can see the product inside. 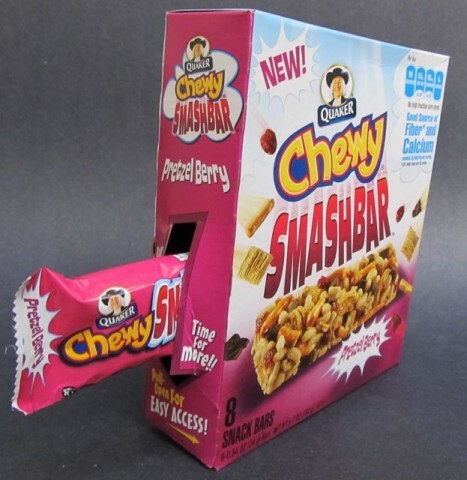 But what they didn’t count on was the ongoing de-evolution of society where thieving shoppers have no qualms about sneaking out a Smashbar when no one’s looking, putting the box back on the shelf…and then whoever eventually buys the package gets seven bars instead of eight, probably! See? Anyway, all that cut into supermarkets’ bottom line and Big Grocery was having none of that! None of it! “Off to the 99¢ Only Store with you,” they ordered, probably! But Quaker taking a bath on this one is where you and I benefit; that is, if you’re able to find any of these at all, and if I’m able to find more. And brother, if I can find more, don’t expect me to leave any on the shelves for you. You’ve been warned. Posted by Ted on November 30, 2011, 6:00 AM.